Prostate cancer, which currently affects 3 million men in the United States, is no longer a death sentence if caught early. The five-year survival rate is very high (~98%) because of effective treatments like hormone therapy, chemotherapy, surgery, and radiation—and for many men with slow progressing tumors, the wait-and-watch approach offers an alternative to treatment. However, for those patients who have more aggressive forms of prostate cancer, where the tumors spread to other organs and tissues, the five-year survival rate is much lower (~28%) and standard therapies only work temporarily until the tumors become resistant to them. Thus there is a need for finding new therapeutic targets that would lead to more effective and longer-lasting treatments. We recently wrote a blog about prostate cancer featuring the work of a pioneer in cancer research, Dr. Owen Witte from the UCLA Broad Stem Cell Research Center. Dr. Witte is well known for his work on understanding the biology of blood cancers (leukemias) and the role of cancer stem cells. One of his key discoveries was that the cancer-causing BCR-ABL gene produces an overactive protein kinase that causes chronic myelogenous leukemia (CML). Protein kinases are enzymes that turn on important cell processes like growth, signaling, and metabolism, but they also can be involved in causing several different forms of cancer. This has made some kinases a prime target for developing cancer drugs that block their cancer-causing activity. Recently, Dr. Witte’s interests have turned to understanding and finding new treatments for aggressive prostate cancers. 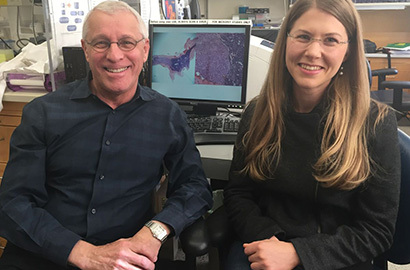 He has been on the hunt for new targets, and this week, Witte and his group published a CIRM-funded study in the journal PNAS showing that a specific set of kinases are involved in causing advanced stage prostate cancer that spreads to bones. They selected a group of 125 kinases that are known to be active in aggressive forms of human cancers. From this pool, they found that 20 of these kinases caused metastasis, or the spreading of cancer cells from the starting tumor to different areas of the body, when activated in mouse prostate cancer cells that were injected into the tail veins of mice. To narrow down the pool further, they activated each of the 20 kinases in human prostate cancer cells and injected these cells into the tails of mice. They found that five of the kinases caused the cancer cells to leave the tail and metastasize into the bones. When they compared the activity of these five kinases in the late-stage and early-stage prostate cancer cells as well as normal prostate cells, they only saw activity of these kinases in the late-stage cancer cells. 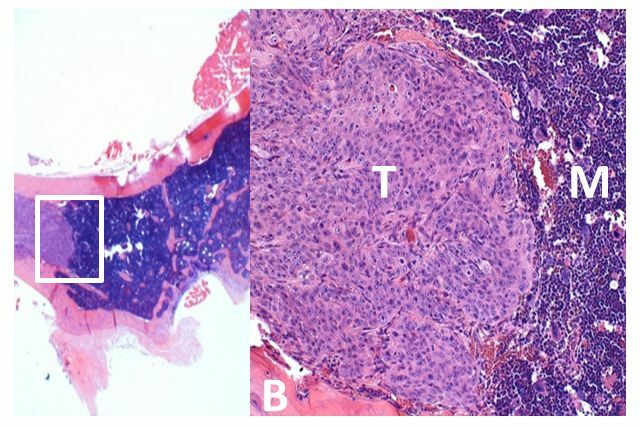 Microscopic view of a hip bone (left) and a magnified view of the bone showing the metastasized prostate cancer tumor (T), healthy bone marrow (M) and bone (B). Image courtesy of the UCLA Broad Stem Cell Research Center. Witte and his colleagues concluded that these five kinases can cause prostate tumor cells to spread and metastasize into bones, and that targeting kinase activity could be a new therapeutic strategy for late-stage prostate cancer patients that have exhausted normal treatment options. Our findings show that non-mutated protein kinases can drive prostate cancer bone metastasis. Now we can investigate if therapeutic targeting of these kinases can block or inhibit the growth of prostate cancer bone metastasis. Cancer-causing kinase activity has been successfully targeted and inhibited before. As a result, chronic myelogenous leukemia is no longer fatal for many people. I believe we can accomplish this same result with advanced stages of prostate cancer with a fundamental understanding of the cellular nature of the disease.